Even though Laura Baumert’s son Andrew can choose whatever book he likes for the 20-minutes daily sustained silent reading program at his middle school, he still finds reading a chore. Over the years, the sixth grader from Washington, Michigan, has been on the receiving end of various incentives to gently nudge him into doing more reading: his elementary school used reading logs and rewards for time spent reading, and at home he is allowed to stay up 30 minutes past his bedtime if he reads an actual book. But so far nothing has done the trick, and Andrew rarely reads of his own volition. Baumert doesn’t really know why her second son doesn’t like reading but keeps on trying anyway, finding places to fit it in between his other interests, which include typical middle school boy stuff: lacrosse, basketball, riding his bike, and playing video games. She takes him to the library often, and gathers good book recommendations from other parents, teachers and librarians, but stops short of forcing him to read a certain number of pages at home, thinking it will do more harm than good. Schools have traditionally taught children how to read, and have always tried to encourage reading. But with an understanding that greater literacy is needed for the 21st Century workforce as well as higher benchmarks to meet, schools like Andrew’s are coming up with programming that not only supports the nuts-and-bolts of learning how to read, but tries to hook kids as well: giving kids free time during the school day to read what they wish, holding all-family “literacy nights” to give away books, reading contests with prizes, and more. Parents often want to do the same at home. Some may feel like Baumert, a veterinarian at an emergency clinic, who said that between work, kids and extra-curricular activities, she’s often too tired to fight the reading battle. She knows that loving reading has a host of benefits for her son; she is just not sure where to draw the line. Despite all the effort poured into enticing kids to read—the prizes, the posters, the contests—many U.S. students say they don't enjoy it. A survey conducted by Scholastic last year found that reading for pleasure drops off drastically for kids after age eight. 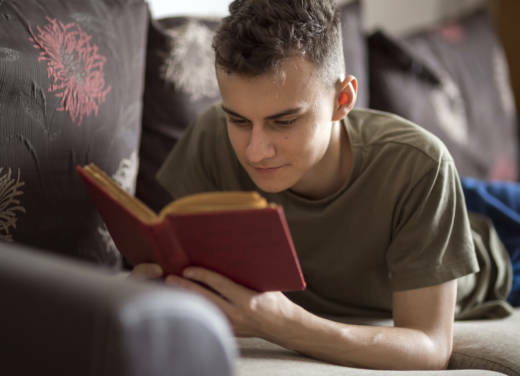 Only 51 percent of kids surveyed said reading is something they like or love to do, a nine percent drop from when the survey was first conducted in 2010. According to the Scholastic survey, three-quarters of parents reported wishing their kids read more for fun. But how exactly do parents do that? Though there may not be a single secret, there are evidence-based things families can do to encourage kids to read outside of efforts made at school, said University of Virginia psychology professor Daniel Willingham, author of Raising Kids Who Read: What Parents and Teachers Can Do. And the first one is tweaking the reasons behind wanting kids to read in the first place. Willingham wants parents to re-imagine the act of reading as having less to do with school and more with a life well-lived. Instead of telling kids that reading books will help them get good grades or find a good career, he said, make reading part of a larger family value: loving to learn. One thing Heitner warns against is creating a Screens vs. Books mentality, in which parents may be tempted to reward “real reading” with screen time. (Willingham also advises to tread lightly with any rewards for reading, though he said sometimes they may work.) Yet parents often feel like digital devices compete for the time kids would use to read, and are looking for guidance. High school English teacher Jarred Amato knows that, for his Nashville freshmen, cell phones are indeed a barrier to reading. In a recent blog post titled “What 100 Ninth Graders Told Me About Why They Don’t Read,” Amato recounts a survey of students and confirms what he already knew: though students cite many reasons for not reading—can’t find a quiet place at home, other responsibilities and activities—cell phones take top priority. “Cell phone addiction is far and away the number one reason my students said they don’t read,” Amato said. “They are almost powerless to it. It’s not just a kid problem, either—adults and kids are reading less around the world. And I think there’s a value to talking to students about that.” In hopes of rewiring a habit, Amato has been having students put their phones away and practice reading quietly in his class with whatever book they like, hoping they will do the same--even for a few minutes--at home. Willingham said that by time kids are teens, when increased autonomy and social activities crowd their days, encouraging reading might be an uphill battle, so it’s best to instill the ‘family value’ early, when children spend more time with parents. And though he said there’s research to substantiate how television’s arrival changed reading habits, for digital devices, it may not be so cut-and-dried—after all, kids have been finding other things to do for a long time. Though Baumert knows reading more would improve Andrew’s school performance, that’s not her number one concern. Critical thinking skills, empathy and a method of relaxation rank high on her list. For now Andrew reads only because he has no choice, but Baumert is optimistic that he will find the book that ‘ignites’ a love of reading. She also loved reading as a kid, and still finds that reading helps her relax and decompress. * Make sure kids have access to books. Drop by the library often. If it’s affordable, leave books lying around the house, in the car, even in the bathroom. * Don’t control kids’ reading. The temptation to “put the hammer down” for a page count may only result in a reaction and pushback. Comic books, graphic novels, and books below reading level all count. * Get kids involved in a peer network of readers. For example, teen author John Green has created an incredible network of readers and fans that connect online. * Offer reading material that draws on something they’re already interested in. If there’s a movie they already love, get the novelization of the movie, or a book about backstage gossip on set. *This post has been updated to clarify Shanghai as Shanghai-China in the PISA results.